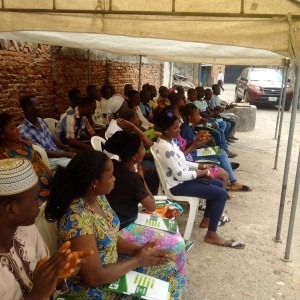 SPACES FOR CHANGE’s Ifesowapo community project, supported by USAID-Strengthening Advocacy and Civic Engagement (USAID-SACE), flagged-off on May 3, 2017 at an inaugural ceremony held in Ebutte-Metta in Lagos. The community-based participatory media and research action project is designed to empower slum dwellers in Badia and Ebutte-Metta with new skills in local research, media production, storytelling, leadership development, and human rights. Building on their creativity and knowledge of their communities, empowered residents of the two targeted slums will counter the dominant negative narratives about slums, often used as a basis to justify the demolition and forced evictions of unplanned and informal settlements. Over 70 residents of the two communities, mainly the youth, participated in the flag-off ceremony where a 12-man Steering Committee was inaugurated. The Committee, comprising 6 representatives from Badia and another 6 from Ebutte-Metta, will serve as the project’s coordinating mechanism. The 12 representatives further comprise of 6 women and 6 men appointed by their respective communities based on capacity, interest, availability, and dedication to community activities and the project. The flag-off ceremony started with a discussion around the popular myths—centered on criminality, prostitution, filth, illiteracy, poverty, disease—usually peddled about slums which portray people living in those areas in bad light. At first, most of youthful participants were too shy to speak. But immediately after some confidence-building exercises that the Steering Committee representatives introduced at the middle of the program, the youth became more emboldened to speak up and participate actively. One after the other, slum youth shared stories, including their personal experiences of the negative labelling often attached to them because of where they live. In the same manner, they took turns to counter those labels, citing numerous examples of the educational and social accomplishments of some youth living in their communities. For instance, in 2015, Moses Ilawole, from Badia-East, won the Most-Likely-to-be-a-President Award at Wave Academy at Batch 14. ‘In Badia, many of us are doing legitimate work’, says Gloria Rotimi. Quite interestingly, the individual storytelling and group discussions soared to competitive heights, with the youth from Badia endeavoring to beat their counterparts from Badia and vice versa. Beyond the competitive debates that ensued, it was obvious that the youth regained their self-esteem and overcame stage-fright. The collective boldness of the youth and the emphatic declarations witnessed at the event heralded the dawn of a new era of voice, visibility and active youth participation in community development. In this new era, slum youth who are traditionally excluded from taking part in decision-making and the local governance of their communities are now determined to overcome the social and institutional barriers that entrench silence. Through this intervention and many more activities lined up under the project, target groups are gaining a new perception of themselves as change agents, and empowered to take concrete steps to address the obstacles to the enjoyment of their economic, social and cultural rights. The formal inauguration of the Steering Committee followed the group discussions. 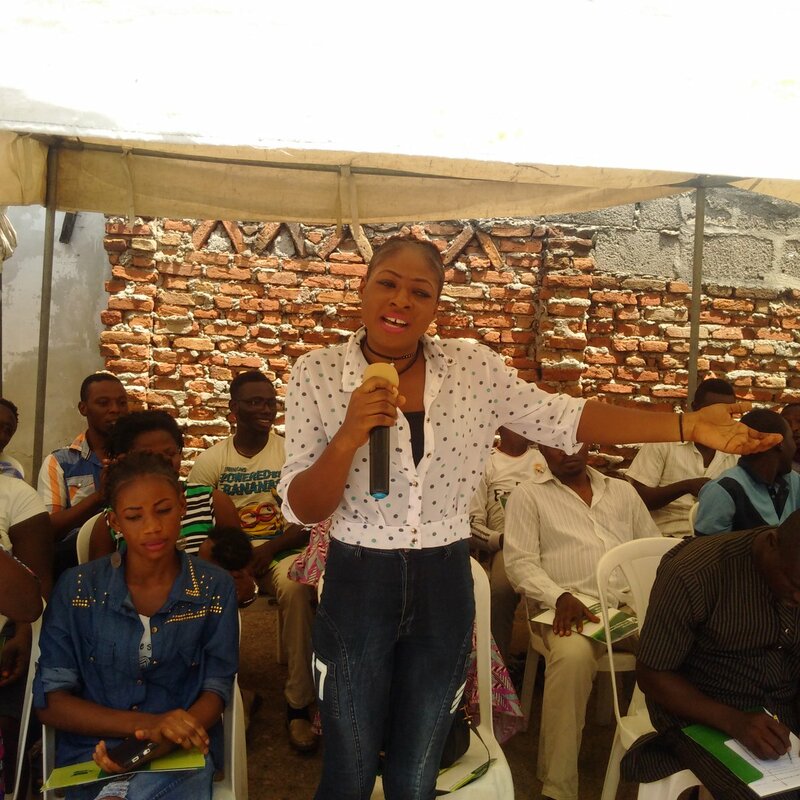 In her remarks during the inauguration, SPACES FOR CHANGE’s executive director, Victoria Ohaeri urged committee members to be fair, inclusive and participatory in their project coordination undertakings. She further urged them to have the people’s interests in mind and duly consider overall development and preservation of the two communities. In their response, two members of the Steering Committee from Ebutte-Metta and Badia respectively, Comrade Agbodemu and Seinde Ebiesuwa, pledged that the committees would carry out their mandate satisfactorily and work assiduously towards moving communities forward. They accepted to serve in the various committees and vowed to work hard to achieve the project’s set goals.